We provide Grounds Maintenance & Commercial Landscape Management from our strategic hubs across the UK. We can work to your exacting specification or create a solution tailor-made to your requirements. When GRITIT looks after your hard standing area, litter and debris will be collected/swept after every visit ensuring the site is free of all windblown material. If your car park is regularly defaced by litter and refuse then our hard standing litter service will make it look neat and tidy throughout the year. Cracks in hard standings, between paving and less worn areas at the edges of car parks, paths and drives are usually colonized remarkably quickly by unwanted vegetative growth and weeds. This can make the hard standing area unslightly, uneven or slippery when wet. Other primitive growths such as moss and algae can also build up in hard standings. GRITIT controls these through proactive hard standing weeding and maintenance. Leaves will be collected and removed from hard standings as standard during the Autumn fall, with leaf clearing collections in October, November and December. At GRITIT we also offer a number of other autumn services to enhance the look of your hard standings and grounds. Even though hard standings leaf clearing is a big part of your autumn clean up, there is more to do then just that. GRITIT's autumn services for your hard standing and grounds can also include everything from maintaining the beds to cutting the lawns. A tree survey are automatically carried out on a three year cycle to ensure all trees on site are in a healthy and safe condition. A GRITIT tree survey ensures that your trees grow in the right shape and direction, and that branches are always monitored to be cleared to 2.4m over paths, 5m over roads, 1m from all street lighting, traffic signs, traffic lights, street name plates and 2m from windows or adjacent premises. Major tree pruning operations can also be carried out by our tree surgeons as and when required. GRITIT tree pruning ensures that you comply with the Highways Act 1980 Section 154 in removal of all low branches. Low branches are constantly monitored, pruned and lopped to ensure that safe and clear pedestrian and vehicular routes are maintained as part of GRITIT standard tree works. GRITIT low branch removal ensures that you comply with the Highways Act 1980 Section 154 in removal of all low branches. Epicormic growth on the base of mature trees will be removed once per year during the winter months as part of GRITIT standard tree works. Epicormic growth are shoots arising at the bottom of the tree - epicormic growth removal ensures that new suckers will be removed or thinned annually using a handsaw, secateurs or chainsaw. Bed and border litter is removed from beds and borders during every visit by GRITIT. This is a standard part of the GRITIT bed and border litter & debris service. Beds and borders can quickly dry out or be taken over by weeds. We recommend use of bark mulch across the soil surface which will bring several benefits to your grounds. Bark mulching is ideal for tidying borders and flower beds after leaves fall, helps reduce grounds maintenance by suppressing weed growth, helps conserve soil moisture during dry weather, reduces soil erosion during heavy rain, insulates plant root area from the weather either freezing or hot and protects the top area around the plants from drying out too fast. GRITIT provides a professional hedge pruning services tailored to your requirements, whether you need regular hedge trimming or an annual prune. Pruning and cutting back will take place during winter months depending on variety and species. We can also extend our hedge services to include small trees and shrubs to keep your garden tidy. Poorly timed pruning and maintenance operations result in cube like structures that have no resemblance to their natural form, loose their seasonal diversity and have a lower ecological value. It is widely recognised that biodiverse green spaces that encourage native wild life and plant species to thrive improve our mental health and wellbeing. This is hugely important and beneficial whether at your workplace, your learning environment or at home. You may be a company looking to enhance your environmental reputation or a school looking to develop a wildlife garden or outside learning area, we are able to help. We understand the importance of green spaces especially in urban areas. Our services include urban wildflower meadow installation, native species planting, tree planting, pond construction, wildlife gardens, habitat hotels, compost areas, invasive species control, bird boxes and feeder’s green walls and green roof installation. We are experts in sustainable planting solutions and use nectar bearing flowers to encourage butterflies, insects and birds creating real living landscapes that benefit people and wildlife. Grass edges abutting beds, borders and hard standings will be re-defined once per year, usually in March. GRITIT's grass edging service is a constructed border to define your lawn, flower borders or pathways - an incredibly effective way of keeping different sections of your garden separated for easy maintenance but also to make it look really neat and tidy. Grass strimming will be carried out with every grass cut to ensure all lawn edges abutting hard standings and obstacles remain neat and tidy in appearance. 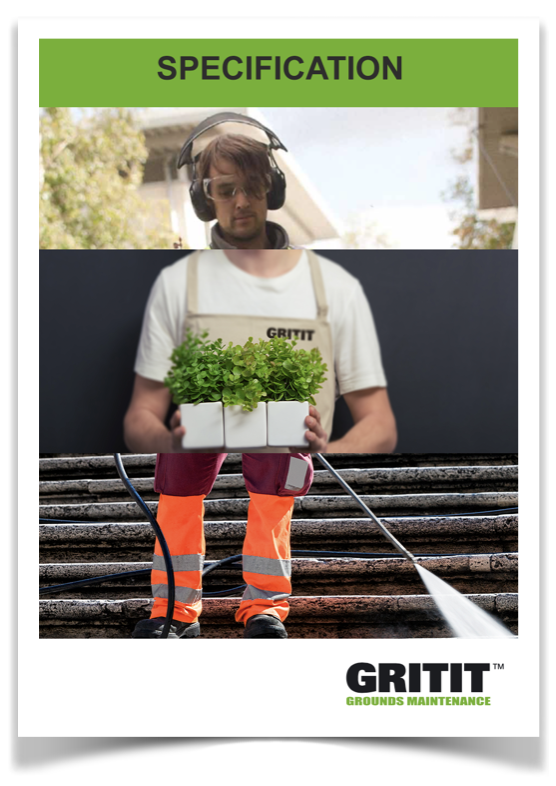 GRITIT also offers general strimming for commercial premises with grassy areas. We cover steep banks, communal areas, large fields, hard to get to corners and rough terrain. Our team of professionals will make event the untidiest of areas into a neat and tidy space. GRITIT rough grass cut areas services offer maintenance of the rough grass areas on your facility twice per year, and more often on demand if you need. Litter will be cleared from all lawned areas before grass cutting starts. If your grounds are regularly defaced by litter and refuse then our grass clearing litter service will make it look really neat and tidy every time that the grass is cut. 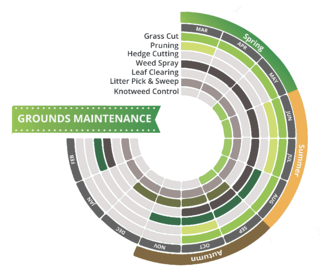 Get a bespoke Grounds Maintenance Quote which is tailor made to your requirements. Click here. As accredited members of BALI (British Association of Landscape Industries), Safe Contractor, Contractor Plus & CHAS, we work to a definitive set of core values and standards which we hold dear. Our bespoke control and reporting technology gives you full and unprecedented access as well as real-time visibility to what our teams are doing day or night. You might be surprised at how much control and visibility we are able to give you. “What a pleasure to see some decent looking landscapers…"
You don’t need to become a horticulturalist. Click here..